This top depicts Kintarō, a semi-legendary figure in Japanese folktales said to be a child born with superhuman strength and great bravery. 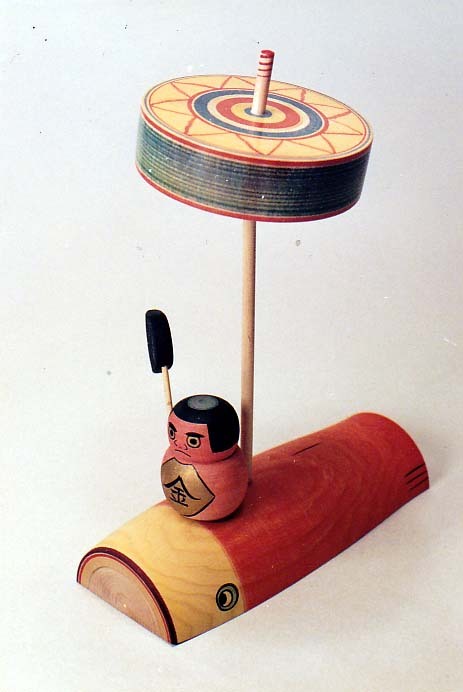 It is customary to put out dolls of Kintarō on Boy’s Day (now Children’s Day) in the hope that young boys will become equally strong and brave. Special carp streamers (koinobori) are also flown on this day, and in popular imagery, a number of famous prints show Kintarō wrestling a giant koi, so the two often appear together. Hiroi Michiaki: And, this is… Ah, Kintarō riding a koi. Mrs. Hiroi: Yeah. Riding a koi. He’s riding a koi. Hiroi: Kintarō riding a koi. Paula Curtis: It is a koi, isn’t it. Hiroi: The koi, too, it’s that koi from koinobori*. It’s not a koi in a pond. So, his mouth is like this and his tail, too, is cut off. Mrs. Hiroi: It’s cut off. * Here, Hiroi-sensei is referring to koinobori, or carp streamers, which are special wind socks flown in Japan to Tango no Sekku (Boy’s Day Celebration), a traditional event now designated the national holiday Children’s Day (Kodomo no Hi).